Emirates’ in-flight mobile phone service provider AeroMobile is expected to register its five millionth user next week. The world’s leading airline for mobile phone services onboard, Emirates has seen a 38 percent increase in passengers switching on their mobile phones and connecting to the service in the last 12 months. The AeroMobile system allows passengers to use their own mobile phones to make and receive phone calls and text messages from Emirates aircraft in flight, just as they would on the ground. Over 220 Emirates flights per day currently offer the AeroMobile service. “Since AeroMobile was introduced on our flights in March 2008, we have witnessed a remarkable rise in passenger usage. Reaching the five million user mark is a significant milestone for Emirates and showcases exactly how popular the service has become,” said Patrick Brannelly, Emirates Vice President Corporate Communications Product, Publishing, Digital and Events. “Use of wireless mobile communications is growing at an incredible speed across the world, taking over from the traditional wired methods of yesterday. People like to be connected, even at 30,000 feet. AeroMobile gives people the flexibility to switch on their mobiles during a flight and, if they wish to, make a call or send an sms. Using a mobile phone on an Emirates flight is now an everyday occurrence for our passengers and it’s a service they have come to expect from us,” added Brannelly. During the last year Emirates witnessed a 42 percent growth in passengers sending and receiving SMS from their phone and an 11 percent growth in phone calls. 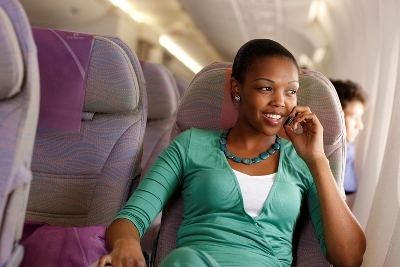 Throughout this period, customers also continued to use Emirates’ existing in-seat phone and messaging services. In 2010 the highest number of phones switched on during a single flight was 227, with up to 65 percent of passengers often switching on their phones. Adding to its already robust in-flight offering Emirates will soon introduce a GPRS data capability allowing the use of BlackBerry type devices on some aircraft. Currently Emirates has 85 aircraft installed with the AeroMobile system, operating to over 85 destinations. An average of two Emirates aircraft are fitted with the system each month. Previous articleWhat you fail to do when starting an online business.